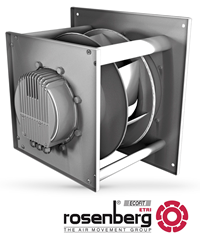 Rosenberg's new KH Series fans include 450 mm, 500 mm, and 560 mm models. They deliver up to 7 inches static pressure or up to 10,000 CFM of airflow at free air for a wide range of HVAC and air movement applications. ...perfect for a wide range of HVAC and air movement applications. Three sizes of Rosenberg backward curved fans with electronically commutated (EC) motors are now available with three-phase 5.5 kW motors for greater power and efficiency. They are 100% speed controllable and are CE, UL and RoHS approved. Rosenberg USA is located just outside Charlotte in Indian Trail, N.C. For more information, or to place an order, contact Rosenberg USA by phone at (704) 893-0883; fax (704) 882-0755 or e-mail sales(at)rosenbergusa(dot)com.